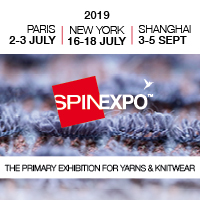 Intertextile Shanghai Apparel Fabrics – Spring Edition 2015 opens at a brand-new venue this week with a record number of exhibitors participating. Over 2,600 suppliers from 24 countries and regions will take part in the biggest ever Spring Edition from 18-20 March at the National Exhibition and Convention Center, Shanghai. The world’s largest fairground hosts its first Messe Frankfurt fair across more than 100,000 sqm, with international fabric exhibitors, domestic suppliers, and Chinese and overseas accessories exhibitors showcasing their latest products. Europe will once again be well represented at the fair in the ever-popular SalonEurope. Around 180 suppliers of premium fabrics and accessories will be housed in this area, including 11 trend forecasters, which also includes the Milano Unica Pavilion from Italy, the Portugal Pavilion, the Germany zone, and the France and Premium Wool zones, which make their debut appearance at the Spring Edition. The diversity that Asia has to offer will also be on display at the country and region pavilions from Japan, Korea, Pakistan and Taiwan, as well as the Texprocil Pavilion from India. And for the first time at an Intertextile fair, the Origin Africa Pavilion from Kenya will be present. Also on offer will be the Verve for Design zone, which features design studios from Australia, France, Hong Kong, Italy and the UK displaying their creative and original fabric pattern designs. While Verve for Design returns to the fair this year, the All About Sustainability debuts there after its popularity at last October’s Autumn Edition. This zone has been made in response to increased interest in sustainability in the industry, especially from China in recent years. Chinese exhibitors meanwhile are grouped together by product end-use. Their exhibits will feature shirting, casual wear and suiting fabrics, womenswear, lingerie and swimwear, as well as functional wear. Also in this hall is the Beyond Denim area. This year’s fringe programme will once again keep the industry up to date on the latest trends and market information. Four international and Chinese Trend Forums provide guidance for next season’s trends, with the Intertextile Directions Trend Forum designed by experts from the around the world, and the Fabrics China Trend Forums focusing on menswear, womenswear and colours. A series of seminars is also held from 18-20 March, with speakers from both China and abroad. Topics include Design and Trends, Technology, Sustainability Issues, Market Information and Business Strategies.